For a few years now blogging has been a huge outlet for me, I first started to find a tool to let our spread out families keep up with us. Like most bloggers it grew into something else, I now love ready my morning feeds on my blackberry to see what all of my blogger buddies are up too. As some of you can tell the last few weeks have been hard on me, we made the final and permanent decision to sell our house and not get anything else. We have divided up our possessions into groups of get rid of, store and loan out. I really can never go home again. Josh’s childhood home is owned by someone else, mine has been remodeled and my bedroom is now the kitchen. My family has started to sell off parts of the farm. With summer starting I think of all the festivals that we shared with our group of wonderful friend in Minnesota. Our new tour is very intense and we work with a big crew. Like I said it has been tough. So for those lovely souls who care what I have to say thanks for hanging on and I am back!!! Thank you for being my inspiration to get behind that camera. To my real life friends to follow thanks for worrying about me. To our families don’t worry about us, we have a plan. Here is a funny one about life on the road, sometime Pippi’s bath is a little more luxurious than others. 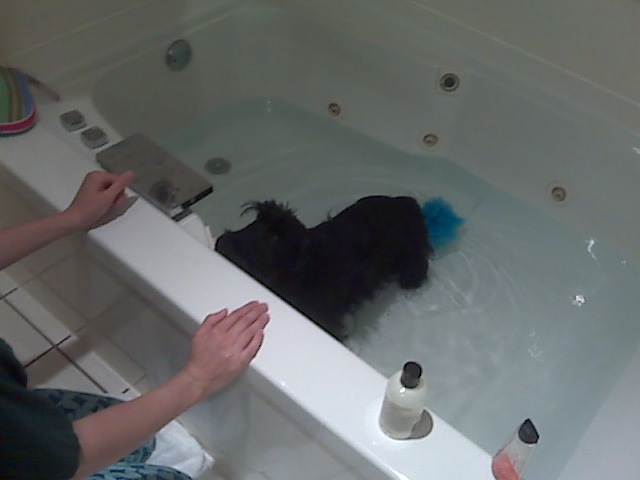 Here is the Birthday Girl getting a “spa” bath.